Big up! 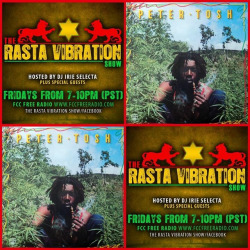 Make sure to tune inn to The Rasta Vibration Show Tonight!!! We have a lot of great reggae music coming at you plus, We have in studio the very talented Tuff Like Iron! We light up the air waves 7-10pm(PST) Live in studio 1A on www.fccfreeradio.com or on all smart devices with the tune in radio App….